A Saniflo Sanivite grey water pump helped a Sydney homeowner relocate the kitchen in her apartment, overcoming the restrictions of heritage building rules. Maurice and Margaret Watson moved into a small apartment in Point Piper after downsizing from a large family home. Having compromised space for one of Sydney’s finest harbour views, the couple didn’t want to compromise on their dream layout. Margaret wanted to move the open plan kitchen from the central living area into a room in the corner of the apartment. However, the heritage listed building presented its own challenges with regulations specifying that the original plumbing couldn’t be relocated or extended. Since the kitchen couldn’t be moved using conventional plumbing, a compact Sanivite grey water unit from Saniflo was installed inside a cabinet in the corner of the room proposed for the kitchen. This enabled the installation of a sink and dishwasher, transforming the room into a kitchen and opening up the main living area. Key benefits of the Sanivite grey water unit include non-invasive plumbing compliant with heritage building restrictions; installation of a sink, dishwasher, washing machine, shower or bath enabled in rooms without plumbing access; ability of heavy-duty pump to push wastewater up to 5m upward or 50m horizontally to mains; and compact design for tight spaces. Margaret commented that the redesigned layout offered much better flow throughout the apartment. She added that the kitchen couldn’t have been relocated without Saniflo. Saniflo made it possible to specify the location of the kitchen sink without being limited to existing sewer connections. This enabled the owners to open up the space with a superb view onto the harbour. 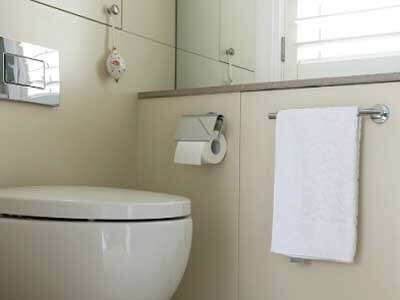 Saniflo pumps have already created new possibilities within the apartment with the couple also installing a new en-suite off the main bedroom and powder room next to the main living area.